Camping, Caravanning and Hiking is a great way to experience the outdoors, whether it be the lakes, coast, countryside or abroad. However, some people miss the comforts of home and basic items such as a table and chairs can be sorely missed when camping. Luxury camping furniture can really help improve the quality of your time spent away and furniture such as trestle tables and camping chairs really help make your holiday experience more relaxed and enjoyable. The choice is pretty wide to offer additional comfort when on a camping or caravanning vacation. The problem for most campers is weight and space. Camping tables fall into two categories which both have similar features. Trestle tables and folding tables. Trestle tables come in all shapes and sizes, and they are suitable for camping, car boots, displays, marketing, traders, stalls, events and catering. The main use of a trestle table is that they will either fold away or are easily dismantled to save space when storing. They are often lightweight with a moulded top, and the legs will often be tubular with a powder coating for durability. They are the ultimate in convenience and strength. Plastic trestle tables are usually made from polythene, blow moulded resin, or plastic resin. Their main features are strength combined with portability. Trestle tables also come in wood or aluminium design but plastic is a combination of strength, price and weight. Folding Tables are very similar to trestle tables but they tend to be used more specifically for camping. Similar to trestle tables they come in all shapes and sizes, and are built from plastics, metals (such as aluminium) and wood, or a combination of materials. Folding tables are suitable for picnics and their foldaway abilities mean that they are ideal for storing in caravans or a car boot when camping. The beauty of a folding table is that you can have a sturdy table for preparing and eating food, and this can be a great help if you're out doors, they are easily wipe-able and should last you a long time if looked after. Camping chairs are extremely popular and have many uses, for fishing, camping, caravanning, hunting, beach days, festivals and many more outdoor activities. 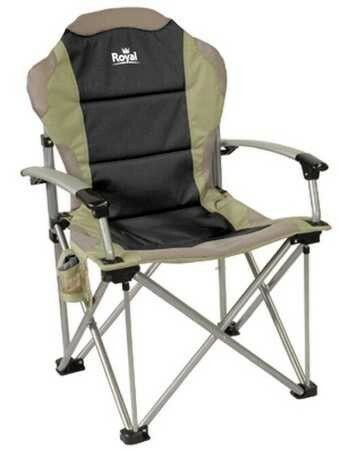 Most camping chairs are foldaway, and have developed over the years to offer comfort and support to the neck and back. More expensive camping chairs have free-form seat designs which help to remove pressure points and offer a relaxed, reclined position. The seating is usually made of a fabric which can be padded for comfort, or sometimes of a mesh material which allows the material to breathe which is important for use in hot weather. Some chairs will come with drink holders which is of extra use if you need a liquid refreshment while reclining. Lightweight chairs will be made of a polyester fabric and a metal frame which will be easy to open and close, this will also provide durability against weathering. You may also find your chair comes with a carry bag and plastic feet to prevent the camping chair from sinking in the soft ground. In all, you will find luxury items such as camping tables, camping chairs and other caravanning accessories at any good quality camping equipment store. It really is worth looking around as these items will help make your holiday one to remember. I find that the cheap folding tables aren't very stable. If you're going to get one its best to spend a bit more rather than end up with something that tips over when someone gets up.